(New York) – Ethnic Rohingya Muslims fleeing Burmese security forces in Burma’s Rakhine State have described killings, shelling, and arson in their villages that have all the hallmarks of a campaign of “ethnic cleansing,” Human Rights Watch said today. Burmese army, police, and ethnic Rakhine armed groups have carried out operations against predominantly Rohingya villages since the August 25, 2017 attacks by Arakan Rohingya Salvation Army (ARSA) militants against about 30 police posts and an army base. Burmese army commander Sr. Gen. Min Aung Hlaing told the media that the government-approved military clearance operations in Rakhine State was “unfinished business” dating back to the Second World War. The United Nations Security Council should hold a public emergency meeting and warn the Burmese authorities that they will face severe sanctions unless they put an end to the brutal campaign against the Rohingya population. The United Nations and concerned governments need to press Burma right now to end these horrific abuses against the Rohingya as a first step toward restoring Rohingya to their homes. In early September, Human Rights Watch interviewed more than 50 Rohingya refugees who had fled across the border to Bangladesh and obtained detailed accounts from about a dozen people. The Rohingya told Human Rights Watch that Burmese government security forces had carried out armed attacks on villagers, inflicting bullet and shrapnel injuries, and burned down their homes. They described the military’s use of small arms, mortars, and armed helicopters in the attacks. Human Rights Watch obtained satellite data and images that are consistent with widespread burnings in northern Rakhine State, encompassing the townships of Rathedaung, Buthidaung, and Maungdaw. To date, Human Rights Watch has found 21 unique locations where heat sensing technology on satellites identified significant, large fires. Knowledgeable sources in Bangladesh told Human Rights Watch that they heard the distinctive sounds of heavy and light machine gun fire and mortar shelling in villages just across the border in Burma, and spotted smoke arising from these villages shortly afterward. The Burmese government has denied security force abuses, claiming that it is engaged in a counterterrorism operation in which nearly 400 people have been killed, most of them suspected militants. The Burmese authorities assert, without substantiating their claims, that militants and Rohingya villagers have burned 6,845 houses across 60 villages in northern Rakhine State. Refugee accounts contradict the claims of Burmese officials. At the Cox’s Bazar hospital, Human Right Watch interviewed several Rohingya with bullet wounds. Some said they were hit while at home, others said they were shot when running for safety from their villages, or while hiding in the fields or hills from Burmese soldiers. Usman Goni, 20, said that he and five friends were in the hills outside their village, tending cattle, when they were attacked. He saw a helicopter flying overhead and then something fall out of it. He later realized he had been hit by whatever the helicopter dropped. Four of his friends died from fragment injuries while villagers transported Goni to Bangladesh for treatment. The fragments in his torso had not yet been removed when Human Rights Watch met him in the hospital. Ali and his family walked to Bangladesh and were allowed to enter by the border guards. They arrived on August 31, and at the time Ali spoke with Human Rights Watch, they were waiting outside trying to sort out where they could get shelter. Momena said that when she and others fleeing with her crossed into Bangladesh, the Bangladesh Border Guards stopped them and said: “We have to stop you but if you shout and insist on entering, we’ll let you in.” She understood this as the guards pretending to obey their orders to refuse refugees entry to Bangladesh, but in practice helping the refugees enter the country. Khatija Khaton, a widow, lived in the village of Ashikha Mushi with her four children. She said that on August 25, an armed group of ethnic Rakhine youth came to her house and issued vague threats. She recognized them from previous encounters because most of them had been involved in the violence against her community in October 2016. The youth were armed with rifles and slingshots. She heard periodic gunshots, and other villagers said that the army was helping the Rakhine youth, but she did not see any evidence of that herself. Jumma prayers were just over that Friday, and the men and boys were outside the mosque when the Rakhine armed men came up to them. Rahim and others took up bamboo poles, that’s all they had, but Rahim panicked when they began to shoot. He started running away. I saw them shoot him – the bullet went through his cheek, right by his cheekbone under his eye. He died from that wound. After witnessing that shooting, Khaton panicked and fled into the hills with her three teenage daughters, ages 13, 15, and 18, whose safety she most feared for. She left her 5-year-old son behind – many Rohingya thought younger children might be safe from attack – but since then, she has no news of him. She learned that the armed Rakhine group had returned to attack her village in the early hours of August 26. While hiding in the hills, Khaton said she saw several helicopters. She also said she heard bombs being dropped near and around her village: “It was a constant boom boom boom.” She saw her village mosque and one house in her village burning. Khaton and her daughters had no trouble entering Bangladesh, but she remains concerned about the security of her daughters, and is troubled by uncertainty and guilt for her young son left behind. Safa said her village was attacked on August 25 by men in uniform whom she assumes were Burmese army soldiers. She and other villagers ran from the village and hid in the nearby hills for a few days and nights. She had heard rumors that some Rohingya youth in her village had been arming themselves and organizing protests, but she did not know this directly and had seen no signs of it. In her panic to leave, Safa left behind the three eldest of her six children, ages 7, 8, and 15. She has received no news about them or her husband, Shafique Ahmed. She said that when she crossed the Naf River, the water level was up to her neck because of heavy monsoon rains. She said she saw many wounded people crossing the river into Bangladesh, but does not know who they were or how they were injured. Safa says she and her younger children did not have any trouble from the Bangladeshi border guards when entering Bangladesh. I remember army helicopters, olive green in color, flying around. I was standing on the other side of a canal, watching all this happen directly across from me. I was very close and saw it all myself. The soldiers were using guns that shoot fire, or something that explodes and sets fire. Yunus was not sure how many soldiers were involved in the operation, but he thinks there might have been over 250. He said he saw about 25 to 30 houses set on fire in Falinga Kiri from his vantage point. He said that at the time of the attack, it looked to him like there were no villagers left; they had all fled earlier. Yunus and his fellow villagers quickly decided to flee their village as well. The next day, August 27, as they were heading toward shelter in neighboring hills, he saw soldiers and police shooting at villagers fleeing. He learned later that one woman had been killed. Yunus said that he did not know of any Rohingya men who had been training or arming themselves, or had engaged in any militant activity. Begum Bahar said that soldiers attacked her village of Kun Thee Pyin on August 25. They wore olive green uniforms and she believes they were Burmese army. She along with seven of her children and other villagers fled in panic when they saw the soldiers and heard gunfire. They ran into the jungle to cross the border into Bangladesh for safety, a two-hour walk away. Bahar said she saw at least three bodies as she fled to the border crossing. One had a cut on the back of the neck and two suffered from bullet wounds. She heard the “boom boom boom” of large weapons firing all day August 26 and 27, as she was attempting to cross the Naf River into Bangladesh. During the river crossing, she lost contact with her 12-year-old son and does not know if he survived. Begum Behar said she was unaware of Rohingya militant training or anti-government activities. She said that the authorities had ordered all Rohingya villages to deposit sharp weapons to local leaders to turn over to the police, so any kind of resistance would be difficult. She did admit that her 22-year-old son had opposed her decision to leave and stayed behind when she left with her other children. Hussein, 19, said that on August 27 at about 9 a.m., about 200 to 300 Burmese security forces in uniform along with local Rakhine men arrived at his village of Kun Thee Pyun (Kwashong in Rohingya). He said they were all armed, but was too frightened to have a proper look at their weapons. They began a spree of indiscriminate shooting in the village. The local police had been harassing us, mistreating us for at least six months before this. They would take away our cows, for example. We were angry about this but we didn’t protest; we knew protesting would come to nothing. Then on the Friday [August 25] before the attack, four people were killed in my village [by the police]. I don’t know exactly how it happened. They were all Rohingya men. We left the village that day and hid in the hills, but came back because the police seemed to back down and leave. We thought it was all over, but it was not. Hussein said that when the August 27 attack began, he and the other villagers fled into the hills. From atop one hill, he saw a helicopter flying over Kun Thee Pyun village, and then almost immediately after he saw houses in the village catch on fire. He doesn’t know what caused the houses to catch fire. He said that none of the villagers in his village were killed or injured during the August 27 attack. He walked for two days and on August 29 arrived at the Bangladeshi border. 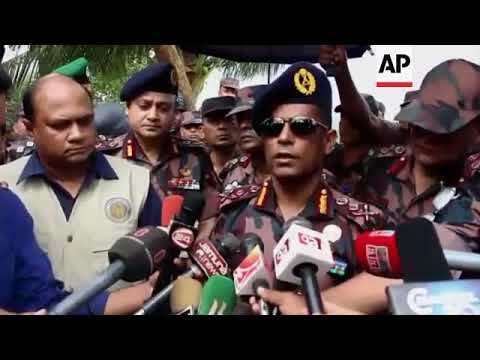 He said the Bangladesh border guards stopped his group at the border for a while, and then instructed them to take another route to enter Bangladesh. The group did that and they were allowed in. Anwar Shah, 17, said that on the morning of August 27, Burmese security forces in uniform opened fire on a crowd in his village of Let Ya Chaung, killing three Rohingya men and a boy, and wounding 18 others. He said he didn’t know the circumstances of the shooting, but there had been tensions between the authorities and local Rakhine and Rohingya villagers for some time. He didn’t think the four were armed or posed any security threat. The dead included Shah’s brother, Abdu Satter, 22. Abdu Shukur, about 50, Nur Alam, about 15, and Haroun, about 25. Their families buried them in the neighboring village of Kum Para because they were too frightened to bury them in their own village. Shah said that after the attack he saw the local village mosque was on fire. He heard that the local police were responsible setting the blaze but did not witness that. Shah said that following his brother’s death, he fled to Bangladesh. He learned that there was a big attack on his village the next day, August 28, and that all houses were set on fire.